The technology advancements in the sports industry has given rise to a gadget friendly audience that leverages the digital equipments for live sports experiences. Companies are looking for ways to capitalize on mobile technology to enhance the fan experience in their homes and as spectators in stadiums and arenas. This has lead to smart arenas-- stadiums with amenities like Wi-Fi that makes the whole concept of sports more informative and engaging for the fans. For the players, technology has created a range of products that are aimed towards improvement of performance. For instance, Big Data Analytics helps leverage better team performances while obtaining insights into players’ medical status and training programs. Apart from tracking performances, data analysis is also likely to contribute to better biomechanics in sports as wearable devices determine how much physical stress players have endured and may even eventually predict the likelihood of injury so a player can be rested before he’s hurt. With such advancements in sports technology, the current need is for organizations is to find the best technology that suit their needs. In the last few months we have looked at a number of sports technology solution providers and shortlisted the ones that are at the forefront of tackling challenges in the industry. The companies featured in this special edition offers key solutions like Wi-Fi enabled stadiums, virtual reality, and various apps that will take the sporting industry to the next level. 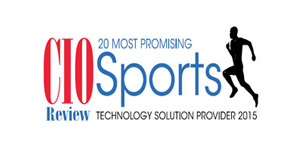 We present to you CIO Review’s 20 Most Promising Sports Technology Solution Providers 2015. Affinity Sports Provides a wide range of products and services to manage all aspects of youth sports administration at each level. ArbiterSports Provide athletic directors, state high school associations and national governing bodies to manage sports officiating assignments and payment to their game officials. Bonzi Bonzi is an online sport league management provider for clubs, associations, athletic teams, and game tournaments. First Sports International Provides business and technology solutions to sports federations, sports governing bodies, clubs, colleges and participant organizations of all sizes. Head Case Company Provider of the Head Case Management System, an affordable three-part system that measures head impacts,records data and delivers diagnostic tools to detect potential concussions. Hopscotch Hopscotch is a mobile engagement platform company for teams and event organizers. Hopscotch offers a complete set of in-venue and out-of-venue mobile services that inspire long-term loyalty and unlock new revenue streams. Horizon Communications Horizon Communications provides telecommunications infrastructure for large venues, stadiums, and arenas. KORE Software Provider of innovative customer relationship management software that enables sports and entertainment companies to drive sales, streamline business processes, and boost profitability. Mobilitie Funds, designs, builds and operates wireless infrastructure at the largest and most complex venues across all major industries, including sports and entertainment, real estate, hospitality, education, healthcare, government, and transportation. OMNIGON A digital consulting firm that delivers strategic, technical and creative guidance to sports, media and entertainment industries. Oppia Performance Provider of an easy-to-use solution for in-depth performance analysis. Ping HD Provides flexible, scalable and affordable digital signage solutions to assist organization’s strategy, design, implementation, monitoring and support on a cloud-based network. PRIVIT The company is dedicated to providing secure and easy-to use tools for managing personal health information. Qualite A provider of energy- efficient lighting for the sports industry. Replay Technologies Provider of freeD technology that enhances viewing experience in sports broadcasting. ShotTracker Provider of hardware/software solutions that track individual and team performance, producing real-time metrics that drive decision making. SportsLabs Provides content to be ingested, managed and then delivered by the Advanced Media Platform to the intercollegiate sports enthusiasts. STATS Sports technology, data and content company, meeting the evolving needs of the sports arena. Stratagem Technologies Cutting-edge research, tools and trading for the sports trading market. Vivature Provides Oracle based EMR system for injury tracking and medical billing services.